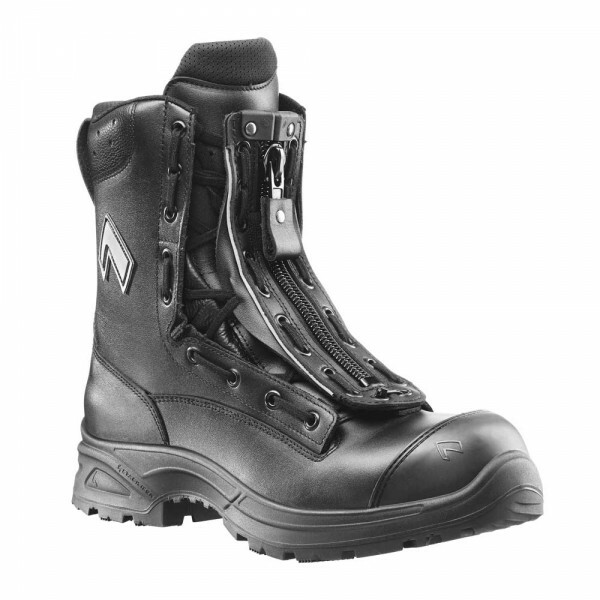 HAIX Airpower XR1, The safety boot for all weather conditions! The HAIX Airpower XR1 is the ideal choice for rescue and emergency services, offering outstanding comfort and stability for people that are on their feet all day. These workwear boots are designed to provide optimum levels of safety whilst enabling the wearer to function all day long, without discomfort. Whether you work in the emergency and rescue services, saving lives or you are in any active role on your feet for long hours, you need a safe and comfortable work shoe. These boots support your foot enabling you to get on with your job. This shoe meets the requirements of safety category S3 with is oil and petrol resistant sole, all terrain grip and a protective, composite toe cap and metal free midsoles. With high quality leather upper, CROSSTECH laminate technology, abrasion-resistant lining and a Sun-Reflect system that prevents the safety boots from getting too hot, these boots are both waterproof and breathable providing great functionality all year round. The sophisticated closure system enables a rapid snug fit to the individual foot. Simply lace using the patented lacing system with inner-lying crossover laces, which reduces the danger of hooking, and then pull up the zipper for a close fit. Cushioning wedge in the sole reduces stress on both the joints and spine, helping to reduce premature fatigue and leg cramps when working over extended periods. For the perfect fit, choose from 3 different insoles with the HAIX Vairo Wide Fit system to adjust the boot to the width of your foot. The red insole (medium) is included. The yellow (wide) and blue (narrow) ones can be ordered separately. CROSSTECH technology prevents chemicals and other liquids penetrating the boot whilst allowing moisture to evaporate out from the boot, keeping feet fresh after a long day. The robust anti-slip rubber/PU sole with its on and off road profile gives you grip on any terrain. The sole is resistant to heat, oil and petrol and is abrasion resistant for high durability. With its non-metallic, reinforced composite toe cap and metal free midsole, the HAIX Airpower XR1 provides the highest level of protection from crushing and penetration incidents. The HAIX Airpower XR1 provides both a high level of protection and comfort in all weather conditions and across multiple terrains. Designed to support the wearer during long periods of active or sedentary work, this boot is ideal workwear for those in rescue and emergency services who need a boot that can be relied upon. Ensisilmäyksellä painava ja erittäin kova kenkä. Kesti pari viikkoa käyttöä, että jalka muotoitui kenkään vai toisinpäin. Nyt 2kk käytöllä uskallan jotain arvostella. Vedenpitävyys pitää kutinsa. Hohkaa kylmän helposti kylmässä vedessä jalkaan. Hengittävyys ok, ei märät sukat 15 tunnin työvuoron jälkeen. Liukkaus onkin toinen juttu, jäällä täydelliset kusiluistimet. Pohjakumi värjää ainakin muovimattoa. Tukevat, siis todella tukevat. Kengän kireyden saa juuri halutuksi sitomalla nauhat "näkkileipään" jolloin varresta saa vetoketjullisen. Katu-uskottavuutta ei kengistä puutu. Pohjan kuviointi juuri sopiva hiekoitushiekan jyväkoolle, jolloin hiekan saa tuotua kätevästi kenkien mukana sisälle ja parkettiin haluttua yksilöllisyyttä. Kengät pysyvät normihuollolla helposti puhtaana. Mainituista huonoista puolista huolimatta hyvä ja laadukas kenkä raskaan työn raatajalle. Suosittelen.